The 'Law of Attraction' (or LOA) as I alluded to in some previous posts (http://xpressyouressence.blogspot.ca/2011/10/gratitude-is-new-attitude.html) declares that it is important to express gratitude and feel grateful for that which is in your life currently. That way, more of the same is likely to actualize ... Hmmm, that's what happened didn't it, going from my current place - see last week's post (http://xpressyouressence.blogspot.ca/2015/03/gratitude-list-2.html) - to my new place. What’s on your list today and/or this past week? Please share with Laurel Regan, the woman who inspired me to do this as I am too busy this week (http://www.alphabetsalad.com/todays-gratitude-list-march-2015-gratitude-linkup-4/#more-16326). Wow! So you finally found the right place to move in. Sounds so from all that you've described here. 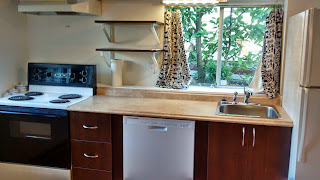 The picture shows a happy kitchen space here. Good, I'm so happy for you. Hope you settle in fast and enjoy the place. Your new place seems wonderful, Elly. I can see that it is bringing you a lot of joy. Your new home sounds wonderful. I am just feeling happy reading about it :) May you have a happy and fulfilling life in your new abode. Your new place sounds terrific from your description. All the best and enjoy it. Sounds like you got a great place, Elly. Enjoy your new home! So many things to be thankful for. You are so blessed to be given such a home with everything you need. I agree with what you focus in magnifies. Being grateful makes you focus more on the great things.